The Matlab programming environment is often perceived as a platform suitable for prototyping and modeling but not for “serious” applications. One of the main complaints is that Matlab is just too slow. 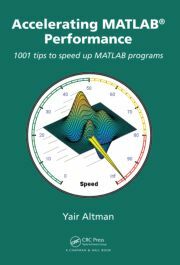 This book aims to correct this perception, by describing multiple ways to greatly improve Matlab program speed. Ideal for novices and professionals alike, the book leaves no stone unturned. It covers all aspects of Matlab, taking a comprehensive approach to boosting Matlab performance. It is packed with thousands of helpful tips, code examples, and online references. Supported by this active website, the book will help readers rapidly attain significant reductions in development costs and program run times. Additional information, reviews and resources. 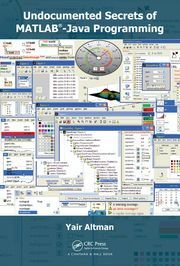 For a variety of reasons, the Matlab-Java interface was never fully documented. This is really quite unfortunate: Java is one of the most widely used programming languages, having many times the number of programmers and programming resources as Matlab. Also unfortunate is the popular claim that while Matlab is a fine programming platform for prototyping, it is not suitable for real-world, modern-looking applications. This book aims to correct this perception. It shows how using Java can significantly improve Matlab program appearance and functionality. This can be done easily and even without any prior Java knowledge. This book shows readers how to use and discover the described components, using nothing but Matlab itself as the discovery tool. Readers are led step-by-step from simple to complex customizations. Within the book’s 700 pages, thousands of code snippets, hundreds of screenshots and ~1500 online references are provided to enable the utilization of this book as both a sequential tutorial and as a random-access reference suited for immediate use. No prior Java knowledge is required. All code snippets and examples are self-contained and can generally be used as-is. Advanced Java concepts are sometimes used, but understanding them is not required to run the code. Java-savvy readers will find it easy to tailor code samples for their particular needs; for Java newcomers, an introduction to Java and numerous online references are provided. Matlab has a plethora of introductory books, but I have a special affection to MATLAB Succinctly by Dmitri Nesteruk, for which I was a technical editor/reviewer. It’s a very readable and easy-to-follow book, and it’s totally free, so go ahead and download. This title adds to the large (and growing) set of free ~100-page introductory titles by Syncfusion, on a wide variety of programming languages and technologies. Go ahead and download these books as well. While you’re at it, take a look at Syncfusion’s set of professional components and spread the word. If Syncfusion gets enough income from such incoming traffic, they may continue to support their commendable project of similar free IT-related titles.